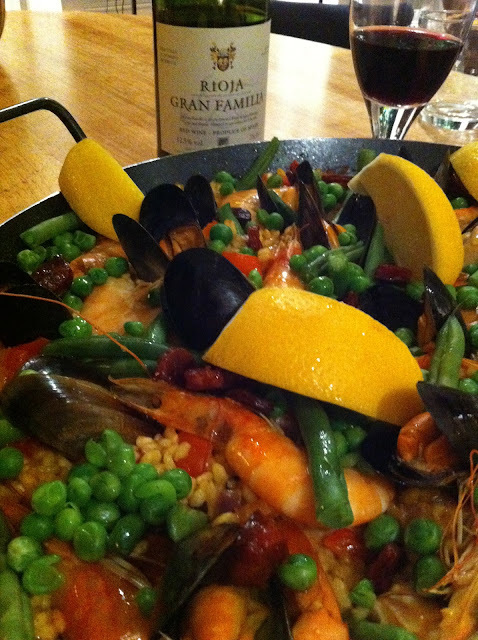 What could be more quintessentially Spanish than Paella? A dish we always have to have at least once when in Barcelona and up to quite recently one we could only enjoy in a restaurant. The purchase of a paella pan however changed all that and now we enjoy making it at home with the ingredients of our choice. They are always guaranteed to elicit a "wow" response and make a really fun sharing dish when everyone is sitting around the table helping themselves. People will always remember "pa eee a" a unique combination of Spanish sunshine and seafood on a plate! There is nothing sacrosanct about the ingredients listed below and almost every one of them can be dropped or substituted with something else. Indeed there are numerous varieties of paella, they can be meat or seafood and some feature more unusual ingredients such as squid ink to make black paella. They are relatively easy to prepare - think risotto without the slow addition of stock and endless stirring. In fact paella preparation is the exact opposite. Counterintuitively all the stock is put in the pan first and only then the rice is added, stirred once then left alone to cook. It is important to get the quantities of stock to dry rice correct otherwise as noted above everything else is flexible. For a little extra kick we like to add chilli flakes, paprika and cayenne pepper. By the way you can substitute turmeric for the saffron to achieve that sunshine colour! Fry the chorizo in the paella pan for about 2 mins and set aside leaving any oil behind. Add the olive oil and fry the onion pepper and garlic until soft and translucent. Add the tomatoes and saffron plus water and mix well. Boil about 300ml salted water in a pan and throw in the mussels, cover until they are all open. Strain reserving the water which should be added to the paella pan with the stock. Scatter the rice into the stock season and cook for 5 mins. Add the beans and prawns and cook for a further 4 mins then turn the prawns over. When cooked remove the prawns. Push the king fish into the rice and cook for 5 mins. Finally arrange the peas, prawns chorizo and mussels over the rice and heat through until the rice is cooked to your liking and allow to stand for a few minutes or if a little too wet place under a grill for a minute or two. Serve with lemon wedges.